The Alberta Dance Alliance wishes Calgary’s Decidedly Jazz Dance a very happy 35th anniversary with a round of applause for their outstanding, ongoing work and the contributions they make to Alberta’s dance community. Excitingly, a new era is upon us with the completion funding for their DJD Centre in Calgary. This facility and the company continue to bring the best in Jazz dance to Alberta’s audiences and students. Thank you for your incredible work. “From its humble beginnings 35 years ago, DJD has grown into a vibrant company that is known for creating original new works with live music, performing in Calgary and touring across Canada, running Calgary’s largest recreational dance school, and now for having built an amazing legacy for our city. 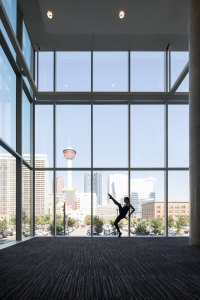 Today, on its 35th birthday, DJD received confirmation from Calgary Foundation of a $1.2M grant to complete the $28.5M capital campaign for the DJD Dance Centre, which opened its doors in April 2016. Calgary Foundation awarded DJD the grant from its Major & Signature Grants program, which supports large-scale charitable initiatives that are broad in scope and transform our community. What a perfect gift for our 35th birthday–it’s the icing on the cake!